You want to know why a single ant is not even a nuisance, while a whole bunch of them gets your attention and a vast number finally builds a complex society? Need an explanation how those few synapses you use to navigate yourself through a bar-conversation becomes a conscious something by sheer numbers? Ever tortured that brain with the question how to overthrow THE world financial system? Emergence is the answer. Emergence develops to the catch-phrase of the occupy-movement as well as the mantra of some proponents of the network-first!-cooperators. Increase the number of actors (cells, fish, occupiers, collaborators…) and something awesome will happen. How? It will emerge! The basic idea is good, the concept, however, not really understood. Emergence does not deal with the self-organized creation of something awesome. Emergence at its very roots describes the upscaling of complexity by increasing the number of participants. Thereby the 'language' necessary to describe the system increases with increasing complexity. A small series of pictures might be instructive. Look at a single ball in an unrestricted space (a). This particle is there, has some properties that might be describable. 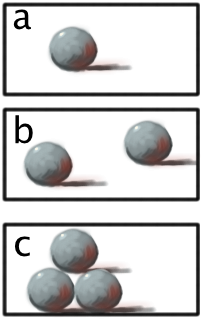 Add another ball (b). These two fellows can be seen in relation to each other (close, far, beside…). But if you add a third marble (c), there emerges a principally new feature: order. These three elements can be ordered (in a line, a triangle…) or disordered. Order is a property that emerged with increasing number of players. And this order will become more and more complex with more balls in the game - but which order locks in is not predetermined. The complexity emerged, the potentiality emerged, maybe even some capacity… but whether a huge chunk of cells is just that (a huge chunk of cells) or develops into a liver or a brain … this is not warranted by the sheer number. The fascination of complexity is one big force that drives curiosity. It appears that the mind is getting utterly excited when a sensoric impression is neither completely predictable, symmetric or repetitive nor random. Pure symmetry and repeated patterns might sooth the aching brain - but boredom is not far away. Complete randomness, on the other hand, is quickly masked as 'background' or noise, unable to keep our attention for too long - equally rapidly discarded from our attention-span. It is the broken symmetry on the one side (the nearly perfect crystal-structure, the flaw in a symmetric image, the spot in a beautiful face...) and the structured randomness (seemingly repetitive patterns in the noise, almost symmetrical structures in an otherwise random system) that catches the attention of artists and scientists alike. Both, it appears, are looking for tools or 'languages' to extend the space of what is describable, in this sense understandable, and to build something like 'safe terrain' to walk on in the humming chaos. While the arts are clearly more free in what languages they chose or devise, the comprehension-expanding but rather strict languages of science (as incomprehensible as they may appear to the untrained observer) make them less ambiguous and the insights conveyable to more. Creativity acts in both worlds, but the ironclad rules of the scientific grammar (mathematics in most cases) allow for a less ambiguous communication of new-found understanding between those speaking the language than the arts could ever achieve within their babylonian conversation. Art often appears to indulge in the quest for new forms of expression - therefore new grammars - to the gain of creativity and expressive richness, but at the expense of comprehendability and generality. The science-artist Tim Otto Roth is one of the most active figures in the quest for the visualization of the scientific world. At the American Museum of Natural History in the very heart of NYC he just opened a show of his recent mapping from the language of science to the poetry of art. The untrained observer - speaking neither in the tongues of science nor arts - feels the vegetative reaction of his organism to the brain's struggle for comprehension and the search for structure - something that would be impossible for the public without the artistic transliteration. Tim Otto Roth by this means opens an emotional door to the sciences that is usually rather tightly shut. He takes the complementary approach to Pythagoras, who described cosmic principles with musical analogues. Roth uses the complex harmonics of nature to compose his dynamic art. As Martin Kemp put it in a review of another installation of Roth's "we stand as witnesses to the chaotic drumbeats of cosmic radiation." At a wonderful summer night I was lying in the grass, my little son beside me. We were staring into the dark sky, debating infinity, other planets, the origin of everything, observing falling stars that were whizzing through the atmosphere at a delightfully high rate. Why did we see so many of them that night? What are falling stars? What are comets. Why do comets return and when? The air was clear and warm. No artificial lights anywhere. The moon was lingering lazy in the trees across the river. Some fireflies were having a good time, switching their glow on and off rather randomly - in one group they seemed to synchronize but then it was random again. It reappeared: a few bugs were flashing simultaneously at first ... it started to expand, it was getting more. A whole cloud of insects was flashing in tune. Are they doing this on purpose? Do they have a will to turn the light on and off? How do those fireflies communicate? And why? Do they communicate at all? My son pointed at a field of clouds that were passing the huge silhouette of the moon. Why was the moon sooooo big? Weren't there ripples in the cloud-structure? A very regular hatching. How do the clouds 'know' how to organize? Do the droplets communicate? We both were excited by the regularities. He said he will figure all that out when he grows up. I knew he felt the urge, the drive that I experience so often as a scientist: the delight of looking at the world in utter amazement and the heartbeat when something appears not completely random. The moments when there appears to be a big hidden meaning of it all. Another evening I was at an opening of a wild underground art show in Berlin. Electro-Music pressed into the sparsely lit room of the hopelessly overcrowded gallery, too many people were pushing, dancing. The humidity was high, the sound physically hurting - we immersed in the crowd. The backdrop of the DJ was a fast, intense, complex video - the central piece of the exhibition. It hammered a coded message. The code was to be unlocked in each and every one of us. What a contrast to the morning when I was reading 'The conductor' by Sarah Quigley while listening to Shostakovich's seventh symphony! My heart beating rapidly, my mind wandering; carried away by the images and emotions of the story and the emotions of the music. What do these scences have in common? In all of them the interaction between the individual and the world is sensual at first. Some sight, some sound, the smell, the heat ... they trigger strong emotional reactions that clearly lie in the deep archaic parts of our brain. But then curiosity sets in: what is the meaning of all this? Is there pure randomness? Is there a structure? This accounts for the richness of those experiences: they span from the almost vegetative reaction of the body and mind to the sensory experience all the way to the curiosity-driven structure-seeking questioning and delight of the almost inquisitory analytic brain. No doubt does the symphony or the piece of art trigger emotional reactions (of most diverse kind, depending on circumstances, experiences, mood...) - but the access can be much more: a musician can understand the harmonic intricacies of the work, can smile about some tricks of the master. A historian will point at the political influence on the composer that can even be seen and felt in the score of his masterpieces. The VJ implanted some messages of recent sociological debate into her visual stream. The gratification of approaching the world on both levels - the immediate, vegetative and the inquisitory, analytical - is much higher than it would be if one of the sides was excluded. It would do the piece of art no justice if it was only to be perceived 'vegetatively', as a simple 'wow' - neither would nature be fully enjoyed this way. And of course it would be a pale, wrong caricature of science if only the analytic part would be emphasized. But seeking the sensory, vegetative approach to science too often results in crippled, touchy-feely science-babble instead of emphasizing the deep emotional impact of the omnipresent human curiosity, the desire to find structures in the chaos and the sometimes fiery emotions related to that. Reducing art, nature, even emotion to a purely vegetative phenomenon is as wrong as reducing science to cold (de-)constructivism. The origin is a clear misunderstanding: the immediate, sensory reaction, the vegetative interaction alone is too often perceived to be equivalent to emotion. But those deep, original, archaic and fundamental reactions of the human species are enriched by the ability to derive additional emotional pleasure (and distress) from the curiosity and analytic desire of the active, conscious brain. Of course we are impressed by increasing click-rates, see our vanity pumped by your mails and indulge in being mentioned in relevant blog-lists.